Stock prices display a number of seasonal trends. The reason for this appears to be related to money flow. There are some times during the year when more money flows into the market. And, on the other hand, there are times when traders seem to take money out of the market. Taxes could be one reason for some of the seasonal tendencies. For example, stocks tend to perform weakly in the first half of April. As you probably know, income tax payments are due on April 15 and this could explain why stocks are weak. Traders are raising cash to pay tax bills. Among the best known seasonal tendencies is the January effect. Typically, in January, stock prices tend to move higher. This effect is especially strong in small cap stocks. Researchers believe it could be due, at least partly, to tax strategies. In December, the theory explains, some traders engage in a strategy known as tax loss harvesting to offset realized capital gains. 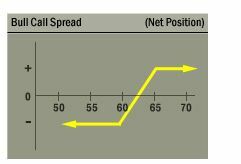 To harvest losses, they sell positions showing a capital loss. These losses can be used to reduce capital gains that were realized earlier in the year when winners were sold. Although the investors sold in December, they may still like the stock. Tax rules require waiting 30 days to buy back the stock in order to recognize the loss for tax purposes. After waiting, if an investor still believes the stock has the potential for gains, they are free to buy it. The waiting period would end in January. Other researchers have offered another possible explanation. They believe many investors receive bonuses from their employer at the end of year. These cash bonuses are then put to work in the stock market over the next month. The January effect was first identified in 1942. That year, a paper in The Journal of Business of the University of Chicago, Certain Observations on Seasonal Movements in Stock Prices by Sidney B. Wachtel, was published. In the paper, Wachtel showed that since 1925, small-cap stocks have outperformed the broader market in the month of January. Subsequent research confirmed this work. Between 1957 and 2007, for example, one study found the average January return for an equally weighted portfolio of stocks tilted toward small-cap stocks was 5.3%, while the return for a portfolio weighted toward large-cap stocks was 2.2%. 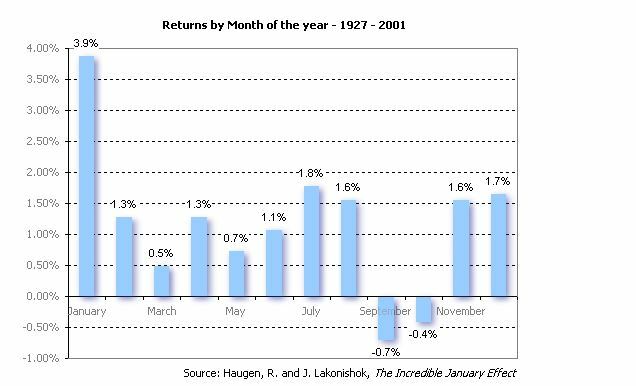 The size of the January effect is apparent from the chart of monthly returns presented by two highly regarded researchers. This chart is shown below. This chart was first presented in their book in 1987 and has been updated since then. The academic literature demonstrates that the effect still works, decades after it was first identified. However, since 2001, the effect seems to be less pronounced. 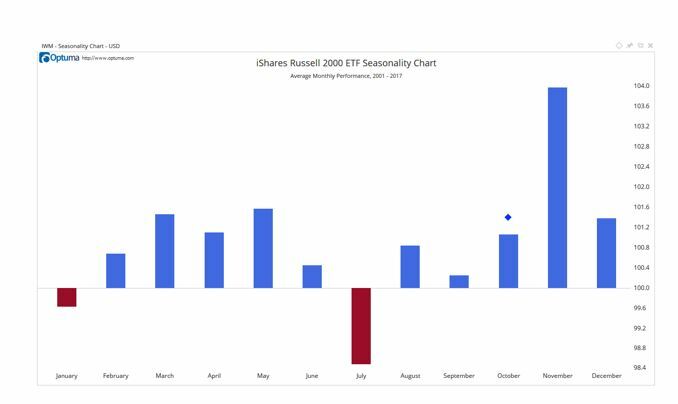 The chart below shows the monthly performance of the iShares Russell 2000 ETF (NYSE: IWM), using data from 2001 through the beginning of this year. Small caps are shown because that has been the segment of the market that delivered the strongest performance. The introduction of exchange traded funds (ETFs) made it easier to trade the January effect and the effect seems have disappeared. This is not a totally unexpected result. Many trading strategies lose their effectiveness after they are published. And, there is actually a valid reason to expect that to happen. In 1942, when Wachtel identified the January effect, it wasn’t possible to easily trade an index. Buying and selling a basket of stocks would require dozens of individual trades and by the time the trading was completed, the index price might have moved significantly. Futures addressed this problem, allowing traders to directly buy and sell an index. Computerized trading then allowed for buying and selling a large basket of stocks. This created an opportunity for arbitrage. Arbitrage requires the nearly simultaneous buying and selling of securities or other assets in different markets to take advantage of differing prices for the same asset. For example, a bond issued by the United Kingdom might trade at one price in London and a lower price in Paris. The lower price in Paris is justified because the French investor will have to complete foreign exchange transactions to buy and sell the security. Therefore, the bond should trade for less in Paris. It’s possible, after considering transaction costs, currency effects, taxes and other issues, that the bond should trade at a 1% discount in Paris relative to London. If a trader spotted the bond trading for 2.5% less, they could buy the bond in Paris, immediately sell it in London and make a riskless profit of 1.5%. There are some large traders who pursue arbitrage opportunities wherever they can find them. It is possible they noticed the January effect and as trading the indexes became simpler and less expensive, they began capturing profits from the strategy. However, to arbitrage the January effect, they would need to buy stocks before January. This way they could sell their stocks to other traders looking to benefit from the January effect. Initially, they could have completed their buying in December. But, as other arbitrage traders entered the market, they may have decided to buy earlier than the traders who entered the market previously. Based on the chart above, it appears that arbitrage traders may have moved the January effect into November. Regardless of the motivation of buyers, the data, as shown in the chart above, indicates it can be profitable to own small cap stocks in November. The iShares Russell 2000 ETF makes it possible to quickly trade small caps. This is a liquid ETF with high volume and a deep options market. However, because small cap stocks tend to be volatile, the options can be expensive. This makes buying call options an expensive trade. A bull call spread can help with this problem. This involves buying a call and selling a second call with a higher exercise price. Selling the call can help an investor pay for the costs associated with buying the first call. Potential risks and rewards of this strategy are both limited and illustrated in the diagram shown below. Any option options trading strategies that works with a stock can also be applied in the same way to an ETF. For IMM, the November 24 weekly options can be used. These closely match the time frame of the optimal trading period shown in the chart above. The November 24 $149.50 call option can be bought for about $3.20 and the November 24 $151 call could be sold for about $2.40. The two transactions would result in a debit of about $0.80. Since each contract covers 100 shares, this trade would cost about $80 to open. This ignores the cost of commissions which should be quite small, just a few dollars, at a deep discount broker. In this case, the maximum possible gain is $70. To find the maximum gain, we find the difference between the two exercise prices. For this trade, that is $1.50 ($151 – $149.50). We then subtract the amount paid to open the trade from that amount. For this trade, that is $0.70 ($1.50 – $0.80). Since each contract covers 100 shares, the gain could be as much as $70. The potential gain of $70 on the trade is equal to about 88% of the amount of capital risked, a favorable reward to risk ratio for many traders. In this trade, options provide income and defined risk that could be lower than owning the ETF. These are the type of strategies that are explained and used in Trading Tips Options Insider service. To learn more about how options can be used to meet your goals, click here for details on Options Insider.